As far as I can see that technical restriction is optional. Just the look and feel of games produced by the computer chosen, with a fixed palette of colours. 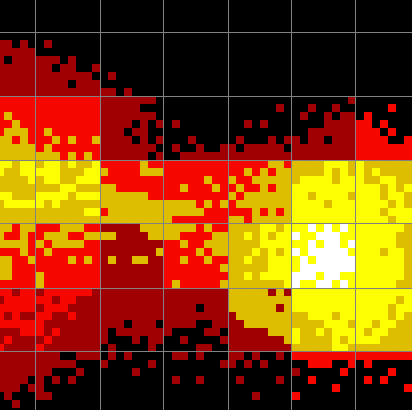 I guess you're not going down the route of max 2 colours in an 8x8 grid?. Looking at that logo, I think he actually is. It's possibly made up of 8*8 pixel UDG's - user defined graphics. If you laid it on grid paper then I don't think he's broken the 2 colour rule. 8x8 2 color. all checked and present the pic above was just a snip - so not starting at the 0,0 origin. Its the top right bit of the screen. Can you find the (current) mistake in it though? And todays head-scratcher is how do I load and display a modern png with loading bars using the spectrum mono interleaved bitmap reveal and separate color attributes? Can you find the (current) mistake in it though? Just a thought: If only two colours are used and one of them is black, wouldn't it be reasonably fast to first draw the sprites in black/white and then multiply blend overlay the 8x8 pixels coloured blocks? I mean "reasonably fast" for the ultimate retro feeling. There's also a problem with the knotwork: two consecutive underpasses in the top right! I predict Adam ends up rocking back n forth in a corner after a mental breakdown. sub pixel stretching (where some lines of pixels up/down maybe slightly different sizes) is something I'm not going to bang my head about. It's something that can be fixed by exact window sizes / 8, but the sacrifices user ability to stretch the window how they want. I've got the initial loading stuff sorted now. Next up is finishing some sound stuff - I don't have load save routines written yet, so I need to get them sorted, or it's gonna be very quiet! Sound will be provided by the QasarBeach Sound sub-system. This is the first public outing of the sound system |I was working on last year. The sound will replicate the AY-3-8912A (the TI sound chip the 128k used). This was a 3 voice chip with ability to mix a noise channel into the 3 voices. So all sounds will be 3 voice only with envelope and base waveforms (pulse, triangle, sawtooth - these will be loaded as predefined waveforms). I've been doing some research on the capabilities of the sound chip and also how it directly sounds in games and (yes there was one for the spectrum) a sound tracker - no samples, just the ability to modify the sounds playing live. So there wont be any samples of sounds, just the QasarBeach doing it all live - yikes! 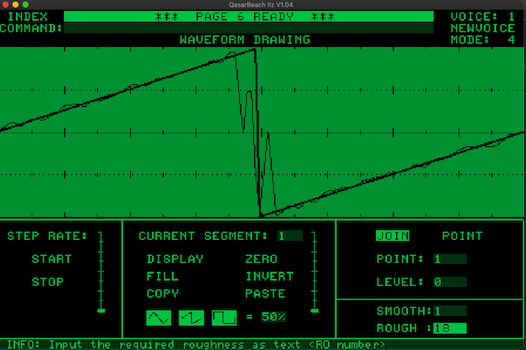 Currently I'm looking at replicating the loading and data sounds from the data cassettes. fun fun fun....! Nah,no point in going all mad getting exact pixel madness. QasarBeach UI looks funky spectrum retro does it plugin to DAW’s like a VST or have you coded your own music maker?